Smartphone radiation could be destroying the memory performance of a new generation of adolescents. Right-handed teens using cell phones are more prone to loss of figural memory which is mainly located in the right hemisphere of the brain and refers to our ability to make sense of objects including images, patterns, and shapes a troubling new study has warned. The study titled, A Prospective Cohort Study of Adolescents’ Memory Performance and Individual Brain Dose of Microwave Radiation from Wireless Communication was published on 23 July 2018 found that cumulative RF-EMF brain exposure from mobile phone use over one year had a negative effect on the development of figural memory performance in adolescents, confirming prior results published in 2015. Figural memory is mainly located in the right brain hemisphere, and the association with cell phone radiation exposure was more pronounced in adolescents using the mobile phone on the right side of the head. “This may suggest that indeed RF-EMF absorbed by the brain is responsible for the observed associations, ” said Martin Röösli, Head of Environmental Exposures and Health at Swiss TPH. It took just one year’s worth of cell phone radiation exposure to damage the part of the brain that interprets images and shapes — and right-handed teens are worse affected. 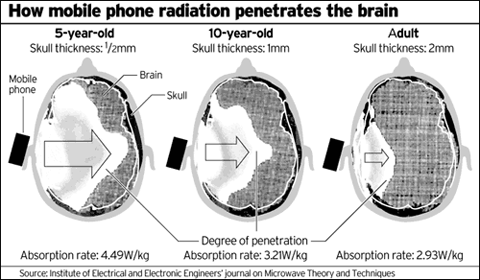 Swiss radiation expert Martin Röösli studied the phone habits of 700 adolescents between the ages of 12 and 17, before making them do memory tests. “It is important parents recognize that children have smaller brains, thinner skulls, softer brain tissue, and a higher number of rapidly dividing cells, which makes them more susceptible to damage from cell phone exposure than adults,” Coates, said.